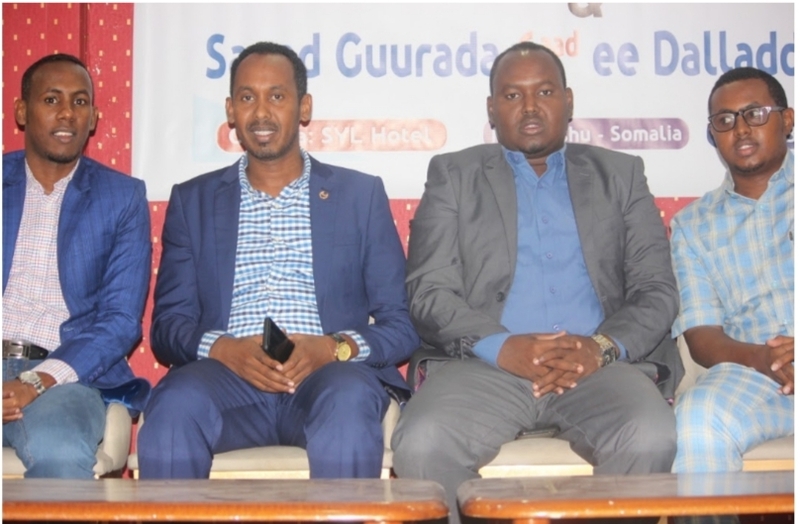 Mogadishu, Somalia, February 13, 2019:an event for the remembrance of the International World Radio Day and the 6th anniversary of the establishment of the Somali Media Association has been held in Mogadishu, Somalia. Representatives from Media Directors from the Somali Media Association (SOMA), media journalists, the civil society organizations, the Minister of Information, Director General of the Ministry of Information and other Directors Ministry of Information, Director General of the Ministry of Information of Hirshabelle Regional State and other guest of honor were invited to attend in the event which was convened at SYL Hotel in Mogadishu, Somalia. 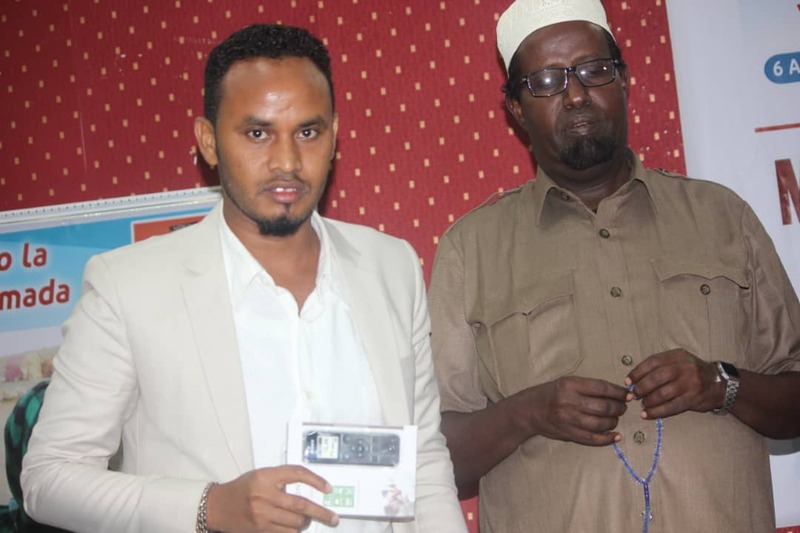 The main topics focused during the commemoration of the two events were observation of the International world radio day and the sixth anniversary of founding the Somali Media Association (SOMA). The main topic of the World Radio Day 2019 adopted by UNESCO is the theme on Dialogue, Tolerance and Peace. The radio broadcasts is expected to provide a platform for dialogue and democratic debate over key social issues that can help to raise awareness among listeners and inspire understanding for new perspectives in paving the way for positive action. A panel discussion was held for the event with main topics covering: Fake news, freedom of expression and the confidence of the community in the radio. The members attending in the panel discussion were: Sheikh Omar Herow, an intellectual, Liban Abdi Ali , Director of the Somali National TV and Ahmed Esse Guurtaale , Director of Mustqbal Radio and the Head of Training Section of SOMA. 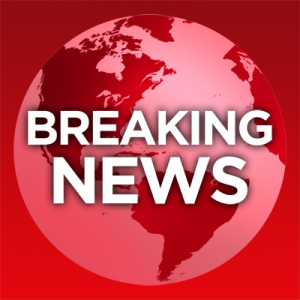 In his opening remarks, Mohamed Abdiwahab, the Secretary General of SOMA has briefly pointed out the Somali Media Association (SOMA) has been founded on February 13, 2013 initially as network 13, then two years after changed to Somali Media Association (SOMA); and has currently more than 36 media houses operational across Somalia, except Somaliland. The Secretary General mentioned SOMA provides valuable media service for the public throughout all the media houses saying SOMA has covered the droughts of 2013 with live programs related emergency programs through the entire media house across the country. “SOMA manages content sharing programs that interlink all SOMA media houses and covers social issues to further improve the awareness raising of the community. 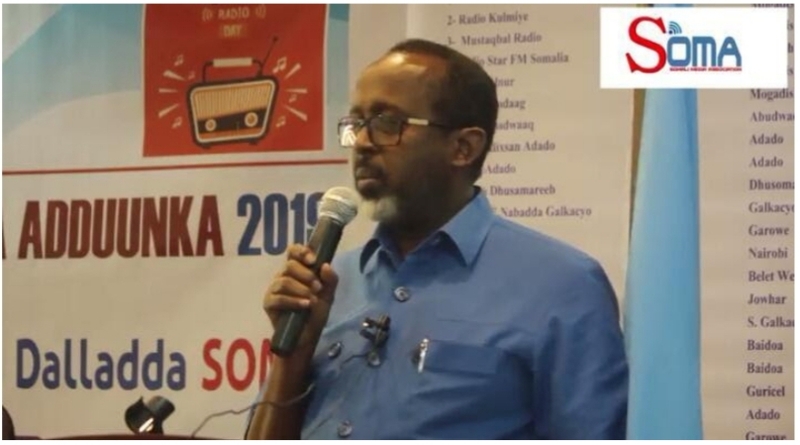 The content sharing program transmitted twice per week and produced by three radio stations per week promotes media serves sharing between the member radio stations and the linkage of community awareness raising on current issues.” Mohamed Abdiwahab, Secretary General of SOMA mentioned. He added that since January this year SOMA is currently working with the Ministry of Constitutional affairs in providing media services for implementation of media campaigns and outreach services for the constitution review process through SOMA media stations across Somalia through 24 member media stations in Mogadishu and all the regional states. He pointed out that SOMA has close cooperation with the Ministry of Information. The secretary General pointed out that SOMA will providing recording equipments which will improve quality radio program production for SOMA member media stations., and he expected SOMA to increase the efforts in coming years. Thereafter, H.E. Dahir Mohamud Geele, the Minister of Information officially opening the event has congratulated SOMA and its role of uniting various media stations across Somalia. 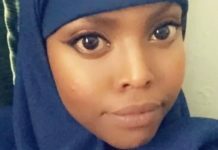 “The private radio stations should take important role in unifying the Somali community, improving the national interest, security and the development of the country. 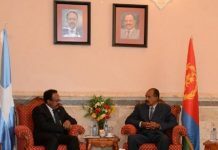 The media stations should cooperate with each other , avoid inciting language and support the idea of nationalism and the transfer of governance through peaceful means ” Dahir Mohamud Geele, The Minister of Information said. He added the Ministry of Information will the support the efforts of the independent media houses. Subsequently, the panel discussions for the event followed focusing on the negative aspect of the fake news, the need to encourage freedom of expression and the role of the radio, the need to link the radio with the FACEBOOK and the positive use of the social media independently. Also, the history and the role of the radio for the community worldwide and how it could take pace with the modern technology have been presented. The issue of strengthening the community confidence in the radio and the free follow of ideas has been discussed. The panel discussion also focused on the need of the radio role to encourage platform of forgiveness, peace and dialogue for peaceful community coexistence. 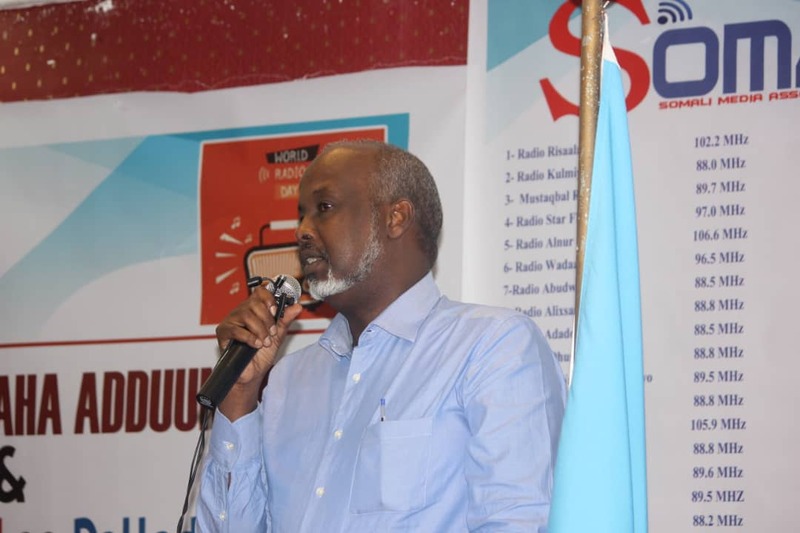 Mohamed Hassan Kulmiye, Director General of the Ministry of Information of the Hirshabelle regional state expressed congratulation for the SOMA 6th anniversary and its achievements of empowering the media houses and journalists over the years. Mohamed Osman Makaran, the Chairman of SOMA has appreciated the guests for their participation and contribution of the valuable constructive ideas which he said will be given special consideration.